How To Plan Your Way To A Successful 2019! If just the thought of creating and following through with a plan is sending you into a tailspin, don’t worry because we have compiled a few handy tips to make the process incredibly easy. Um… January flew by… did it not? Can we talk about a little self-care for a second? When the start of a new year arrives, you may feel the pressure to make a list of resolutions to change your life for the better. However, the reason why most resolutions fail is because there may not be a plan in place, there is no way to track progress, or we forget. Right? So, how do you plan to live your best, most successful life in 2019? What steps do you take? This is also the reason why we’ve ditched resolutions and have opted for a theme! A theme helps ensure HOW we approach our goals, keeps us motivated and focused. BUT! The most important tool you need to ensure that your 2019 is the best it can be, is a game plan! With so much going on over here at TCF, we HAVE to have a plan. Sometimes, even a plan for the plan! You see, planning offers a host of benefits that can completely change the way you run your life. Prioritize. Prepare. Plan. When your life is planned out properly, you have more time for the things you truly want to do, and can better maneuver life, right? Right. Beyond a Planner, Here are Some Tips to help you Beast 2019! In the age of digital dominance, it may be hard to recall the last time you actually wrote something down, but it’s actually the key to planning things out successfully. Sometimes you need to physically see something written down in order to remember or commit to it and that’s where writing things down is essential. 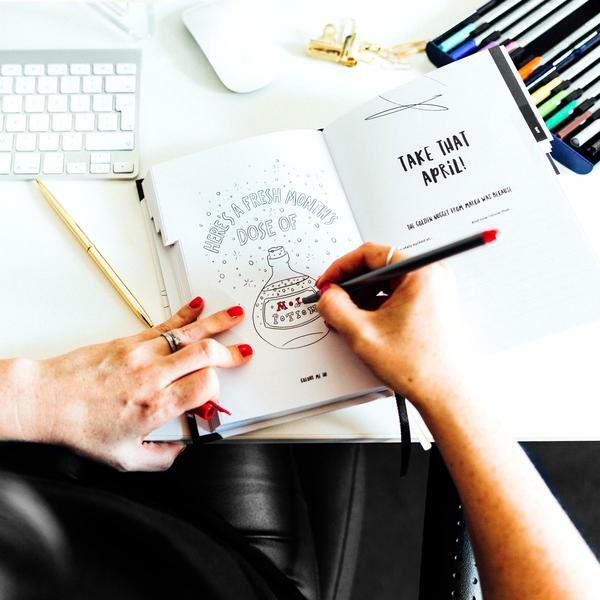 Pick up a yearly planner, write your existing schedule into it, along with any goals and aspirations you have for the new year. You got this! Once you firmly set out a life plan, it’s crucial that you don’t feel the need to rush to complete everything on your To-Do list. Pacing yourself is important because you won’t feel overwhelmed or disappointed if you don’t achieve everything all at once. You also need to remember that your lifestyle plays a large role in how much you are able to do at any given time, so be realistic. Whether physical or digital, make sure that everything in your life has its proper place. On the surface the benefit is just eliminating clutter, but on a large scale it’s teaching you how important the art of organization is to keep your life running smoothly. You should start with the area(s) that need the most help and work your way down. So, if your emails are so out of control, that they keep you up at night, start here! Start the process of deleting and organizing, paying special care to what is a need vs a want. This also trickles down to smaller things such as receipts, keys and TV remotes; everything should always have a specific place, if even in a junk drawer. A sure way to fail is to aim for something that you realistically know you can’t achieve. This doesn’t mean that you shouldn’t push yourself and reach for heights unknown, it means that you have to know yourself enough to know when something truly can’t be done. SMART GOALS= Specific, Measurable, Achievable, Relevant, and Time-based goals. Sit down and write out a list of goals for 2019. Next to each goal, write down how realistic it is for you to accomplish it within a 12-month time-frame. Also, remember that you don’t have to achieve everything in one year and it’s totally fine to have some things carry over into the next year and beyond. We know it’s hard, but in order to successfully adhere to an efficient lifestyle plan, you have to be prepared to simplify things. This means that you must take a look at your life and your needs and decide what you can do without. The best way to do this is to recruit others to help you because they will be more willing to streamline things than you will. As a rule of thumb, remember that if something has been of no use to you in the last year, it should be eliminated because it’s occupying unnecessary space. This is also true for your time commitments! If you are spread too thin with your schedule don’t hesitate to simplify and cut back. If just the thought of creating and following through with a plan is sending you into a tailspin, don’t worry! You are not alone. Hopefully, these tips will help to make the process less intimidating and more exciting. Things are always difficult before you actually do them, so relax and take the steps to make 2019 your best year yet! Tell us, what are your plans for 2019? Are you a planner by nature or could you use some help? What are your tips for success? Let us know in the comments! Hey You, Need a Little Pick Me Up? Here’s Your Confidence Boosting Checklist! Can Affirmations Boost Your Self Esteem? We Put it to the Test! Need a Confidence Boost? Consider a Saucy Plus Size Boudoir Photo Shoot! Instead of a List of Resolutions, Why Not a Theme for the New Year?